Urban myth? Urban legend? Rural folklore? Pretty much every small town across America has its fair share of tall tales that supposedly have some connection to local history. In this anthology, the common tie is the fabled Ol' Man Wickleberry. You might have heard one of many renditions of his legend: one part Grizzly Adams, two parts Yetti, toss in a dose of pure crotchety meanness, and you get my drift. While there is a common theme among these short stories, the specifics of the legend vary greatly. 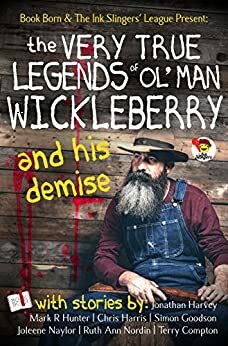 Some legends stem from Ol' Man Wickleberry's prowess as a hunter, others delve into the supernatural. The shorts are very creative: abilities to body swap, shape-shifting, heck, there is even talk of rabid, zombie bunny rabbits! So gather around the campfire. Pass around your favorite bottle of strong liquor and hold that loved one just a bit closer to you. When word of Ol' Man Wickleberry is shared, it is best to be in good company. Because you know, all legends have some basis in reality.